Covertly located on 5.1 acres Casa Encantado is near the Encantado Resort in Tesuque, New Mexico. 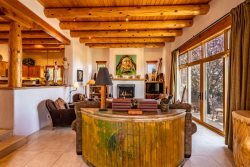 Just 18 minutes to downtown Santa Fe Plaza and Canyon Road; this two bedroom plus a sleeping den and two bathroom casa offers huge views of the Sangre de Cristo and Jemez Mountains. The outdoor patio and grill are perfect for beautiful sunset entertainment. Artistes or writers will especially appreciate the secluded environment that provides panoramic star gazing for those romantic or inspiring nights. The diversity in sleeping accommodations is perfect for any small family: King, Queen, and a double trundle bed. Sleep comfortably with Air Conditioning!